Jean-Marc Chatellier’s French Bakery is located in Millvale and isn’t too far from my office, so a few times recently I have taken the long way to get to work and stopped by Jean-Marc’s to try a few different items. My first trip I ordered a few croissants, I got a chocolate, apple, cherry and almond cream. I have never had in my life a croissant stuffed with anything unless it was a breakfast sandwich. The almond cream was by far my favorite but the apple and cherry weren’t bad either. I was a little disappointed with the chocolate. I tried a taste of the chocolate as is and there wasn’t much chocolate in it. So then I decided to heat it up in the microwave for about 10 seconds and that made a huge improvement. 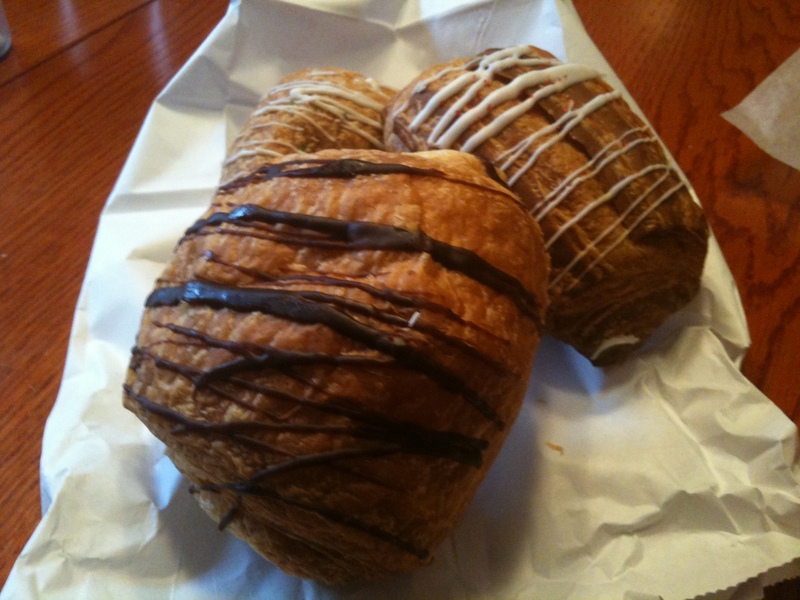 I could actually taste the chocolate more because it melted slightly throughout the croissant. All of the croissants were very fresh, light, flaky and flavorful. If you like croissants I suggest you give these a try. 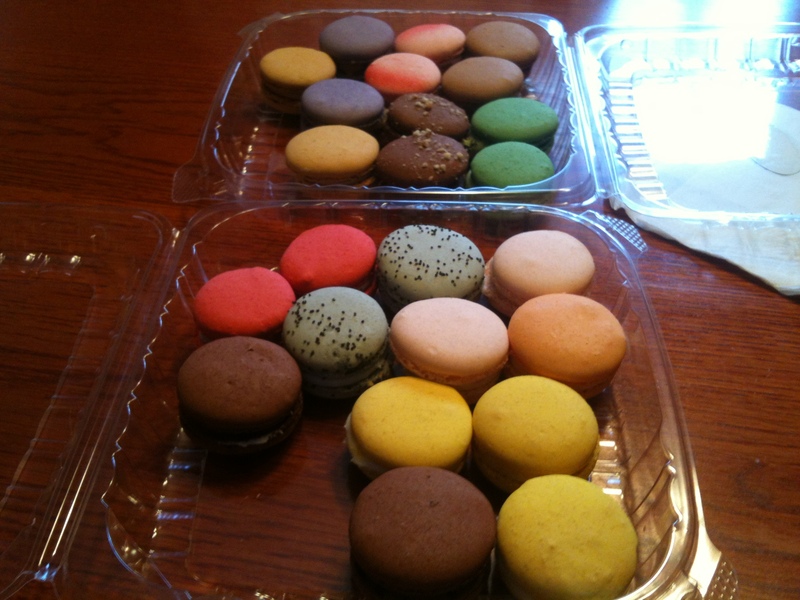 After my first trip I went out Jean-Marc’s website and noticed that they list themselves as THE Pittsburgh Macaron destination, and I remembered seeing them while I was there but didn’t really know what a macaron was. I know what a macaroon is and I’m not a fan. A quick description from the website was ‘A flavored white chocolate ganache is sandwiched between a delicate almond meringue “cookie”.’ So yesterday I stopped by and ordered some Macarons, figured if I’m gonna try them might as well give them all a try to see if there is a favorite. The lady that helped me told me her favorite was the Lemon, I would have to concur! Lemon was by far my favorite, Pistacio, Rasberry and a surprise of Peanut Butter & Jelly rounded out the favorites. I do not like Peanut Butter & Jelly sandwiches and was surprised I liked this macaron. All of the macaron’s had a nice crisp shell and the cookie itself was very soft and chewy which is how I like any cookie. The flavored ganache depending on the cookie was good, it really depends on taste I think because my least favorites were Peach, Poppy Lavender and Nutella (I really don’t get this Nutella craze right now). There are a few other things I would like to try from Jean-Marc’s and I look forward to my return trip. The funny thing about my recent trip with the Macaron’s is my friend sent me an email the other day about Food Trends Men Hate and Macaron’s were on the list. If you try something and don’t like it that is one thing, but if you are hating something because it you think it doesn’t look masculine or whatever reason then man up, grow up and try it. I can’t say I will be a repeat Macaron customer, but I took the time to try something I never had before and I can say I did that. I won’t give the response of macaron’s not being masculine, thats just a ridiculous answer. Anything I blog about here is by taste alone. Another blog talked about guy foods that women don’t like and sure I enjoy a lot of foods like chicken wings and another friend brought to my attention pizza (more specifically Vinnie Pie being manly) and I think a pizza like Vinnie’s could be considered manly because it is just a big pie with grease and fatty foods (mostly pig) ham, sausage, pepperoni. I don’t see many women being attracted to that, but if you are a woman and that is your ideal pie the more power to you! Macarons are the ultimate baking challenge. Those things can be so tricky. If you’re competitive and into baking, it really shouldn’t be a food trend you hate. You should be loving the challenge instead.